Perfect for small or large accounts, for organizing and storing your cleaning supplies. Two organizing shelves for easy access to different supplies and accessories. The perfect janitorial cart for businesses, hotels and other commercial facilities. Rubbermaid really packed in the extras on this one! It contains 2 shelves for storing your cleaning chemicals, supplies, and accessories. A vinyl garbage bag liner keeps trash contained and doesn't allow trash bags to rip or tear. This deluxe janitorial cart from Rubbermaid also contains a shelf for storing your mop bucket & wringer, or an upright vacuum cleaner. 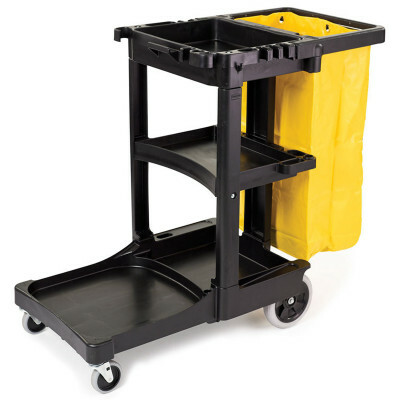 Take a look at our complete line of janitorial carts for other options. 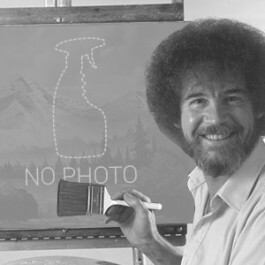 Smooth, easy to wipe down and clean surfaces. Loaded with features engineered to save you time and money. Comes with yellow vinyl bag for storing trash or launderable items. Easy to assemble with minimum tools and effort required. Non-marking wheels and casters protect the floors and surrounding areas. Customers who were interested in the Rubbermaid Black 3-Shelf Janitor Cart (#6173) w/ Zippered Yellow Vinyl Bag were also interested in the following items. This is a review for the Rubbermaid Black 3-Shelf Janitor Cart (#6173) w/ Zippered Yellow Vinyl Bag.